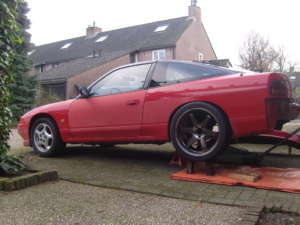 Converting the factory Nissan 200sx multi-link suspension to double triangular front and rear suspension. The 1st picture of the Ferrari shows a front view of the arms, as can be seen the upper arm is shorter than the lower and angles upwards. 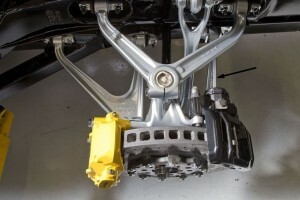 This promotes negative camber when the suspension is compressed in corners, adding grip. 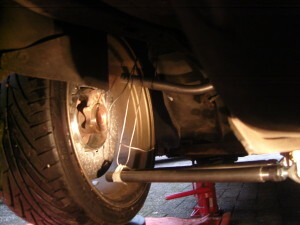 This type of suspension is easy to adjust, has predictable alignment and strong. It also allows for long, aerodynamic arms such as the Audi LMP race car seen in the 3rd picture. Using very long arms has the added benefit of less trackwidth change when the suspension compresses, but even more important the mounting brackets for the arms can be attached to the gearbox saving a large amount of weight replacing a subframe to hold the arms. However, one of the major disadvantage is the ‘static’ behaviour. By setting the arms to a setting that allows good grip in corners, tyre wear increases. The best alignment for grip under acceleration will reduce it in corners. And on many cars there’s not enough room to attach the upper arm, or it costs too much to do it. Therefore, most manufacturers settle with less complex systems such as the McPherson system. So what is multi-link suspension? As can be seen the lower arm is tilted at the front and slanted off centre. Where a triangular system uses 1 upper arm, here 2 are used with different lengths and mounting angles. 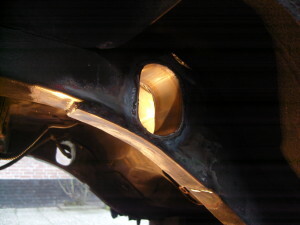 A regular toe arm at the rear is fitted. The combined effect of the oddly placed and shaped arms – all of uneven length – has a positive effect on handling. As can be seen the toe arm is extra long, so that when the suspension compresses, it causes toe-in for better stability. The odd angles of the lower arm help retain trackwidth under suspension compression. But many other effects are covered, like anti-dive during acceleration, active camber response during cornering etc. One important aspect is the compliance in the bushings, Nissan designed the suspension to make ‘use’ of this compliance for particular reactions while also keeping the car comfortable. The compliance in the bushings also allowed Nissan to make use of a newly developed rear wheel steering system called Super Hicas, that replaces the toe arms with electronically controlled steering arms optional on some Nissans. Multi-link is a great system and is being used on cars today such as the Nissan GTR and Porsche GT3. However, multi-link has a couple of disadvantages over a double triangular system. The problem is the need to run (rubber) bushings that allow too much movement on a road/race car such as my Nissan project. Also, when lowering the car, the angle of the control arms starts to upset the suspension’s behaviour, as it was designed for factory ride height. When trying to increase the trackwidth the multi-link control arms can’t be lengthened more than a few millimeters in order not to upset the geometry. A multi-link system is heavier than a double triangular setup, and considerably more difficult to align. As I wanted to increase the width of my car from 1690mm to 2000mm, lower the weight, use solid bushings and be able to easily align the car the factory multi-link system has to go to make place for a double triangular setup. When designing a new suspension setup from scratch, there’s an almost infinite amount of factors to take into account. It would be impossible to go into all details and motivations for choosing a particular design throughout these pages, but I’ll try to cover as much as possible, and as much I want to publish. The first thing I did, was set the limits and observe possibilities. I removed the factory suspension as a whole and measured available space and what could and could not be modified. 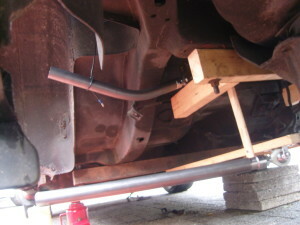 I loosely hung up several tubes and fabbed a wooden sample subframe to get a good impression. When I designed this system I did not have Solidworks so the design was drawn up on paper. 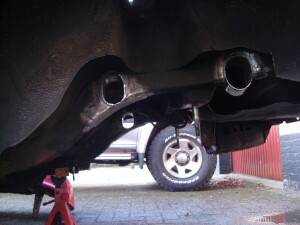 The underbody of the s13 at the factory rear suspension is spacious. The factory fuel tank was removed (will be replaced by a performance tank later) and a notch had to be cut from the spare wheel well. 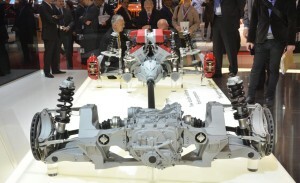 Seriously problematic though, as can be seen in the picture above, the chassis beam interfered with the upper control arm. Even by pressing the upper arm in a bend, it would still jam up against the chassis beam. 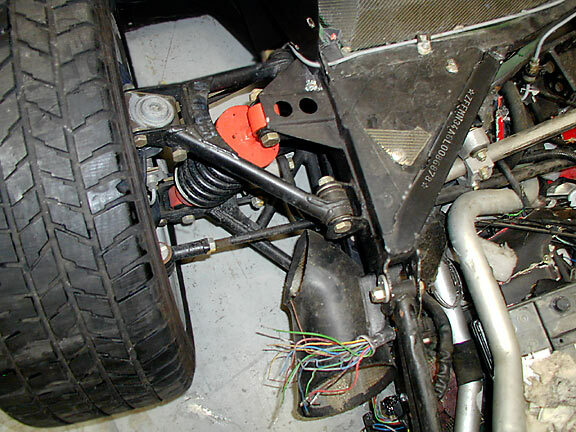 Cutting these beams weakens the chassis, even with the large roll cage welded into the Nissan’s chassis. I decided to cut oval holes in the beams, and welded a strong piece of stainless steel in place. An additional steel strip was welded underneath it. The rear beam cut is not yet fully reinforced in these pictures. With the limits set for what can be mounted and fabricated, I designed the subframe, control arms, knuckles, brake caliper alignment, emergency brake relocating (factory is a heavy drum system within the rear disc) differential mounting within the subframe, and countless other factors. I decided to keep the 4 factory main mounting studs in the chassis for the subframe, and add additional mounting point where the rear seatbelt catchers used to fit. For added drivetrain strength, the factory R200 differential is converted to the stronger (and larger) R230V differential with associated driveshafts. A double triangular suspension can be made in several layouts. The location of the arms does not seem to effect handling that much, and is usually based on where the chassis fittings are best located. The following pictures show several variants. The Pagani layout was designed around a knuckle that could fit all 4 wheels, with different bolt-ons to fit each corner. The toe arm sits at the same height as the upper arm. 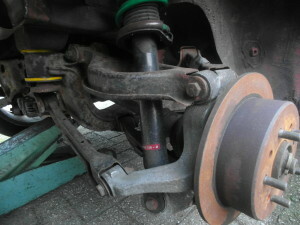 The joint for the lower and upper arm are vertically in line with the center of the wheel bearing. The downside to this design is a higher load on the toe arm, result of the compromise for being used as front knuckles as well. The Lamborghini layout puts the lower arm out of center, further up front, and the toe arm back (indicated by black arrow). This design is better than the Pagani layout as it was designed as a dedicated rear suspension knuckle only. The picture of the Ferrari FF shows the toe arm approximately halfway in height in between the upper and lower arm joints. Both the Pagani and Ferrari setup allow toe adjustment without changing the camber. However, if the camber is adjusted on the Ferrari (regardless if it’s done through the lower or upper arm) toe will change as well. On the Lamborghini and Pagani, toe and camber can be individually adjusted without affecting the other. With the Lamborghini layout being superior to the Pagani I set out to design a system much like it. Why I’m paying so much attention to the ease of alignment is the fact that I want to be able to quickly adjust the suspension at times like going to track days. After I measured the available space within the chassis I set out to design the knuckles first. Like the Lamborghini setup above, I wanted to run a seperate emergency brake caliper for lower weight. By deleting the factory e-brake drum system, not only is the system much lighter, it also allows for a light, thin aluminium disc bell. 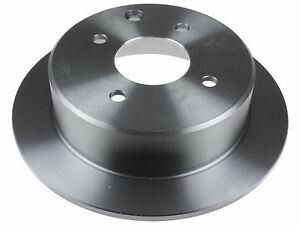 The factory drum brake requires a wide, steel bell and deleting it will save over a kilo on each side. 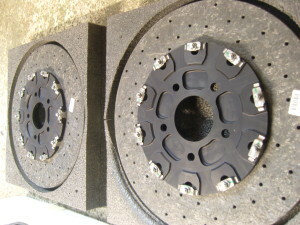 Note the picture of the wide offset factory 200sx brake disc, and the thin custom aluminium bells on the new Ferrari discs. The Aston Martin setup clearly shows the seperate e-brake caliper. In order to save more weight I wanted to delete the factory wheel bearings. 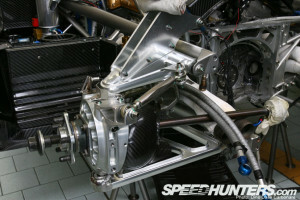 These are similar to the Pagani Zonda as seen in the picture above, being a seperate unit in which the hub is pressed. The bearing is then bolted with 4 bolts to the knuckle. 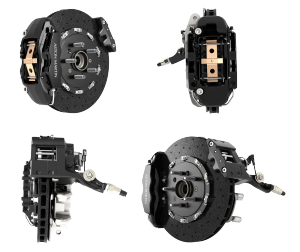 This a cheap and easy-to-replace solution, and allows the use of a thin knuckle, but it pushes the hub surface away from the knuckle, requiring a large offset brake disc and shorter control arms. A better way is to replace the bolt-on wheel bearing by a press-in bearing directly into the knuckle, like many McPherson front suspension systems have. The design limits for my custom knuckles were mostly dictated by the abilities of my milling machine. 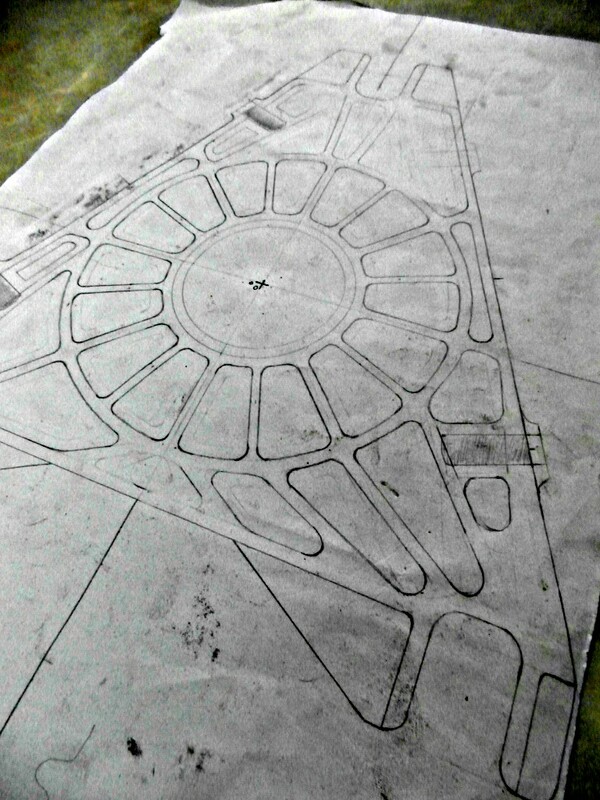 By cutting holes based on coordinates, complex shapes can be produced, but deep cuts is another thing. I performed several tests and concluded that 70mm was the maximum depth at which 11mm and larger mills could be used. 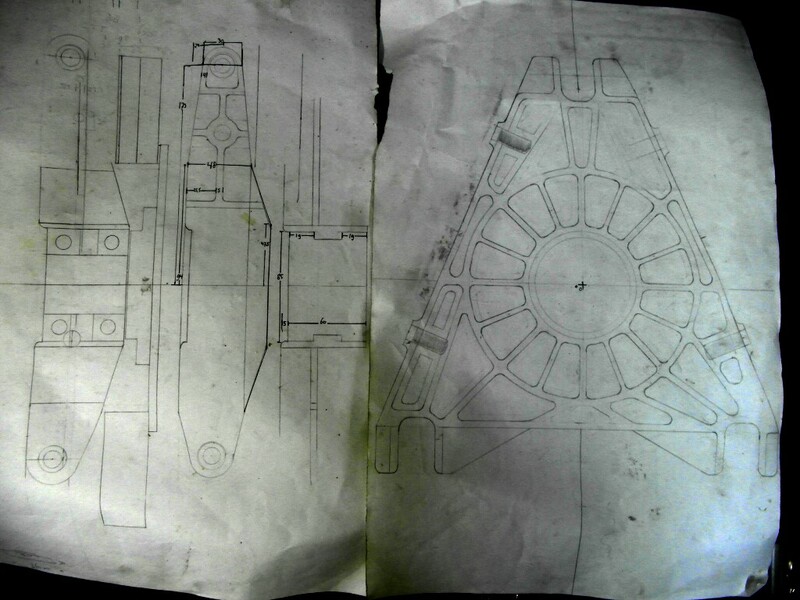 As in 2013 I didn’t have Solidworks to do the work, I drew up several designs and settled with a triangular shaped model. 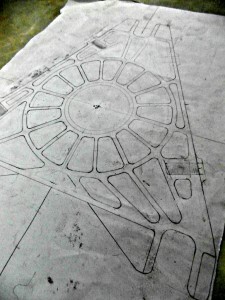 The front and side view were slightly changed as some sections were impossible to make. Like the Lamborghini Aventador, there are 2 lower joints (one for the toe arm) and 1 on top. 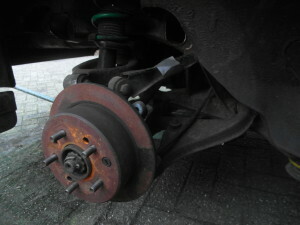 The brake caliper is mounted slightly slanted, and the e-brake caliper is mounted to the bottom, as this was the lightest solution. The ‘flower’ pattern allows cool air to enter the brake disc when using a special guide like the Pagani Zonda pictured above. With the bearings being pressed in and their steel casing expanding less quickly than the aluminium knuckle from brake heat, cooling for the knuckle itself also prevents overheating and loosening up the outer bearing cases.